Description: Japanese knotweed is a herbaceous perennial plant, growing in dense patches between 3 and 15 feet in height. Japanese knotweed forms stout, zig-zag stalks swollen at the node, which are hollow and smooth like bamboo. The stalks persist through the winter, but new plants arise from the extensive root system. .
Leaves are oval to triangular and pointed at the tips. Flowers appear in small, creamy-white clusters in the leaf axils in late summer. 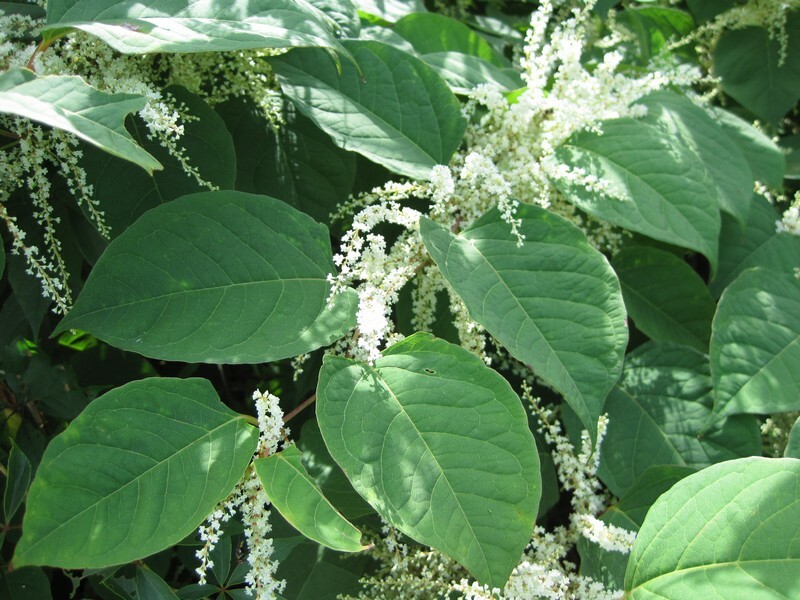 Habitat: Japanese knotweed is tolerant of saline environments, heat, shade, drought, and scouring conditions in riparian zones. It also colonizes disturbed areas such as fill dirt and construction areas. Invasive Traits: Once established, his plant grows vigorously, quickly building a hearty root system. Roots are known to spread through the substrate sometimes penetrating foundations, and breaking apart even the smallest fissures in rock or cement, causing foundational damage to property. When growing in riparian zones, plant tissue can be carried by water and spread downstream where it can root and establish new populations.